Apple Inc.’s marketing mix (4P) indicates how the company matches its business activities to the conditions of the global market for information technology, consumer electronics, and online services. A company’s marketing mix involves the strategies and tactics pertaining to the implementation of a marketing plan. The focus of the marketing mix is on the 4P variables, namely, Product, Place, Promotion, and Price. In this business case, the marketing mix is specific to the technological nature of Apple’s business. For example, the company’s 4Ps encompass multinational operations in the consumer electronics market, the information technology market, the Internet services market, and the digital content distribution market. Such diversity in operations brings Apple Inc. in competition with a variety of firms, such as Google, Amazon.com, Samsung, Dell, Lenovo, Sony, and PayPal, as well as Microsoft, IBM and Intel. These competitors are known for their aggressiveness in innovation and marketing. As a result, Apple has a marketing mix that involves various strategies and tactics that correspond to the approaches of these other firms. In developing its marketing mix, Apple Inc. uses an approach that focuses on premium branding. This approach involves capitalizing on the premium brand, and ensuring that all of the 4P elements support the maintenance of a strong brand image. For example, Apple’s prices match its premium brand, as well as the corresponding consumer perception that equates the company’s products with high value and high quality. Reinforced with appropriate 4Ps, such response to the market enables the corporation to keep its wide profit margins. These conditions help fulfill Apple Inc.’s corporate vision and mission statements. These product lines are associated with human resource utilization and business processes based on product-based divisions, which are a characteristic of Apple Inc.’s corporate structure. The Mac product line includes desktop and laptop computers of various sizes for different market segments. On the other hand, the iPad, iPhone, iPod, and Apple Watch are mobile devices with some functions similar to those of Mac products. This element of the marketing mix shows that the company operates in the consumer electronics products. In the company’s current strategic management approaches, the Digital Content product line includes digital music, videos, e-books, and games. Through digital content, Apple TV, and Software like mobile apps, among other products, Apple Inc. operates in the digital content distribution industry. Moreover, the company’s 4Ps include products based on cloud technology, which allows customers to store and access their data, and use software as a service (SaaS), such as iWork for iCloud. The product lines in this 4P element are based on the outputs of the product development growth strategy (see Apple’s Generic Competitive Strategy & Intensive Growth Strategies). This element of the marketing mix reflects Apple Inc.’s evolution from a computer technology business into an increasingly diversified business with focus on information technology. Apple Store is a subsidiary of Apple Inc. that operates physical or brick-and-mortar stores that sell the company’s products, along with related products from other manufacturers. For example, these stores sell MacBook units, as well as peripheral devices from other companies. 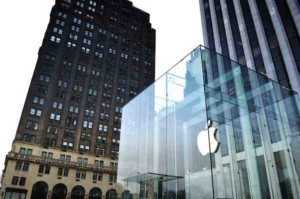 In addition, customers can buy products through Apple’s website and online stores for desktop and mobile. Customers can buy consumer electronics through the company’s website. Apps, music, movies, and other digital content are available through online stores for desktop and mobile, such as the App Store and the iTunes Store. In this element of the marketing mix, the inclusion of these online distribution channels helps optimize international market reach. Also, Apple Inc. includes authorized sellers in its distribution strategy. These sellers operate stores in various strategic locations, such as in shopping malls in different markets around the world. The sellers include large retail firms like Walmart and Best Buy. Some authorized resellers sell through their own stores as well as their seller accounts on Amazon.com. Moreover, the company has agreements with various telecommunications companies, such as Verizon, AT&T, and Sprint, which offer iPhone units integrated into some of their telecommunications service packages available to subscribers in local or regional target markets. Thus, Apple’s marketing mix is comprehensive in taking advantage of online and non-online distribution channels. Apple Inc.’s marketing mix includes advertising, such as on Google’s digital advertising network and on technology news websites. The company has agreements with various prominent websites to advertise and promote Apple products. In addition, the company uses personal selling in the form of Apple Store employees who provide product-specific information in the aim of convincing store visitors to make a purchase. Also, among the 4Ps, this element involves sales promotion, which usually happens at the Apple Store locations and authorized reseller locations. For example, some locations offer old models at discounted prices when bundled with larger or more expensive products. Moreover, the company uses public relations to optimize its corporate image. For instance, Apple Events, leaks of new product features, press releases, and exclusive interviews are carefully executed to maximize positive publicity. The company is also involved in various initiatives, such as ConnectED, which aims to improve formal education outcomes, while promoting the business and its products. These efforts are linked to Apple’s corporate social responsibility strategy and stakeholder management efforts. The company uses such communications tactics to satisfy this element of the marketing mix, pertaining to business needs in reaching more customers worldwide. The premium pricing strategy involves offering products at a premium. In theory, a premium is an amount that is applied in addition to the typical or common price. In this regard, Apple’s use of the premium pricing strategy sets high prices for its products. For example, in general, iPhones are more expensive than Samsung smartphones. Premium pricing maximizes profit margins. Even though the SWOT analysis of Apple Inc. shows that such high prices are a weakness, the company utilizes premium pricing in combination with premium branding and creative innovation. Such combination ensures competitiveness. Creative innovation is supported through Apple’s organizational culture. Aside from premium pricing, the company also uses the freemium pricing strategy. This strategy involves “free” and “premium” pricing combined into a single strategy. In this freemium pricing case, some of Apple Inc.’s products are free, but customers pay to access more, advanced, or better features. For example, the company offers free 5-gigabyte iCloud storage. However, to add more storage capacity, customers must pay a recurring fee. In this regard, Apple’s marketing mix is aligned with premium branding and associated product design and development efforts. Apple Inc. – Apple Events. Apple Inc. – Find a Store. Apple Inc. – Form 10-K.
Apple Inc. – iCloud Storage Plans and Pricing. Borden, N. H. (1964). The concept of the marketing mix. Journal of Advertising Research, 4(2), 2-7. Carpenter, G. S., & Lehmann, D. R. (1985). A model of marketing mix, brand switching, and competition. Journal of Marketing Research, 318-329. Constantinides, E. (2006). The marketing mix revisited: Towards the 21st century marketing. Journal of Marketing Management, 22(3-4), 407-438. Danaher, P. J., Hardie, B. G., & Putsis Jr., W. P. (2001). Marketing mix variables and the diffusion of successive generations of a technological innovation. Journal of Marketing Research, 38(4), 501-514. Datta, H., Ailawadi, K. L., & van Heerde, H. J. (2017). How well does consumer-based brand equity align with sales-based brand equity and marketing-mix response? Journal of Marketing, 81(3), 1-20. Gronroos, C. (1994). From marketing mix to relationship marketing: Towards a paradigm shift in marketing. Management Decision, 32(2), 4-20. Naik, P. A., Raman, K., & Winer, R. S. (2005). Planning marketing mix strategies in the presence of interaction effects. Marketing Science, 24(1), 25-34. U.S. Department of Commerce – International Trade Administration – The Media and Entertainment Industry in the United States. U.S. Department of Commerce – International Trade Administration – The Semiconductors Industry in the United States.